Dressing up as a vampire is quite an obvious idea for Halloween yet for some reason it's not a video that I have made (well not until now that is). As with all the looks that I do for Halloween I have tried to keep this as simple and easy as possible. There may be a few things that you may have to purchase but on the whole, pretty easy to recreate. I love Halloween and I get pretty excited about it come late September/early October where I can start putting together ideas and looks. 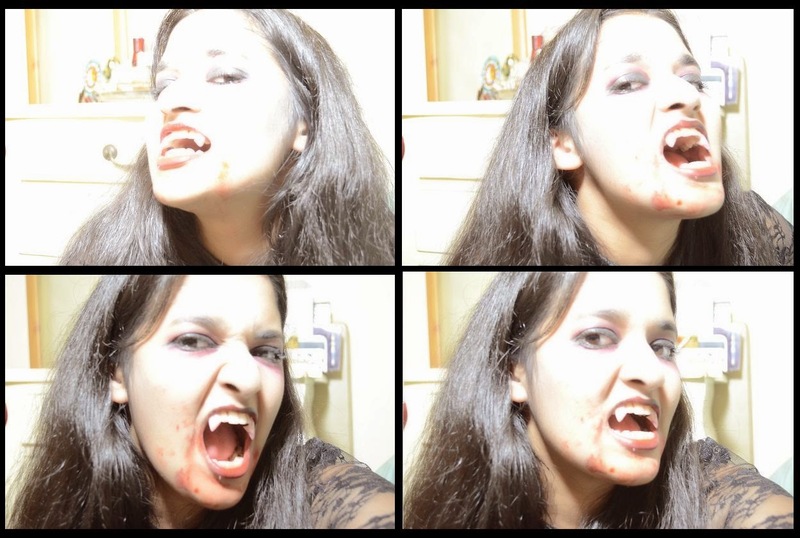 So when I came across a set of fake Vampire fangs on Amazon, I was excited. I bought them straight away. I liked that it was two fangs instead of a whole set which meant that it would be suitable for anyone. I also liked that comes with teeth putty to make sticking the teeth in place a lot easier. After using the vampire fangs, I have to say I am disappointed. The adhesive was very stick and incredibly messy; it went everywhere but in the fake tooth pockets as it was meant to. So in the end I had a alot of glue and lipstick stuck on the fake teeth and the teeth actually did not stay in place. Even in the six minute video that I upload you can see it come off twice. Also the colouring of these teeth are not at all like real teeth and you can definitely see the difference. I would say that these are good if you are going to create some effective vampire photographs. But if you are looking for teeth for a night out or for at least a few hours then I would recommend against these, which is a shame as it's cheap and readily available (thank you Amazon), but there's really no point in having them if they fall out so easily.